How many referrals were made to the Child and Youth/Adolescent Mental Health Service for the calendar years of 2016, 2017 and year to date to 1 September 2018? How many children/young people were on the waiting list as at 1 September 2018, broken down by age range? The longest time a child/young person was on the waiting list as at 1 September 2018? The average wait time from referral to initial appointment? How many mental health professionals (FTE) work for the child/youth service? How are children/youth triaged when referred to the service? 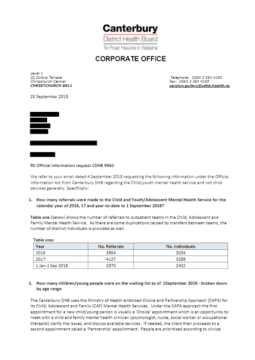 How long are children/youth funded to see a mental health professional under the CDHB service?